In the last post, I showed that irrigation should occur when half of the available water in the container is used. That amount of water is what evaporated from the soil surface and the plant extracted (transpiration), collectively called evapotranspiration (ET). You might think that the total ET accumulated from the last irrigation would also be how much water is needed to fill the soil completely back up with water. In some way it is like your car's fuel tank, the volume of available water is analogous to the capacity of the fuel tank. You're supposed to refuel when the fuel tank is half full, and at that point you fill it up with a half of a tank. That's where the analogy ends though. Actually some adjustments are still needed, especially when applying this to the entire irrigated crop. More water than a “half a tank” needs to be applied to compensate for the salinity in the irrigation water and the inefficiency of the irrigation system. First, let's look at the salinity component. The concentration of salts in the soil solution is a result of the added fertilizer nutrients and the salts in the raw irrigation water. Salinity in solutions are measured by how well they pass an electrical current, the electrical conductivity (E.C.). Many of the ions, from added fertilizer salts, such as ammonium, nitrate, and potassium will be absorbed in large part by the plant. But not all will be absorbed. These ions and others are mostly selectively taken up by the plant and not just drawn into the plant passively with the water pulled in by transpiration. Many of the other salts are taken up at low rates or excluded all together. As a result, the concentration of these salts may accumulate, that is, if there is no leaching. Fig 1. 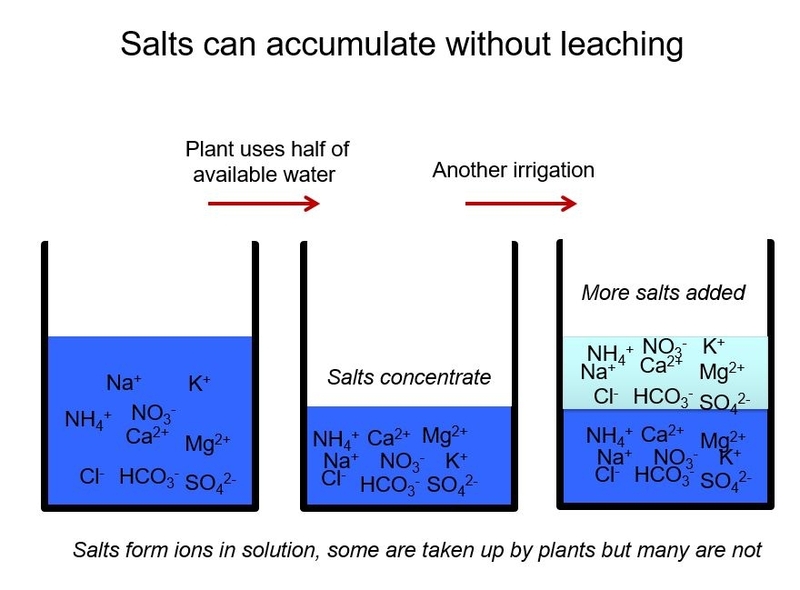 Fig 1 Salts accumulate if there is no leaching. Salt accumulation in the soil is ameliorated by leaching, which is applying enough water so that some water drains from the pot. The leaching fraction can tell us how much extra water to apply. It is the ratio of the volume of water leached (the water that runs out of the bottom of a pot) to the volume of water applied (the total amount of water applied to a pot). 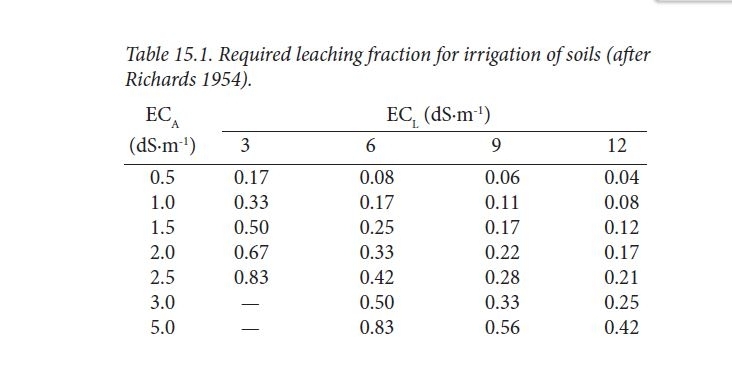 The proper leaching fraction depends on the E.C. of the irrigation water applied (E.C.A) and the E.C.- sensitivity of the crop . Most crops tolerate a leachate EC (E.C. L ) of 6 dS/m to 9dS/m while salt sensitive crops tolerate 3 dS/m. So, recommended leaching fractions are given in the table below. 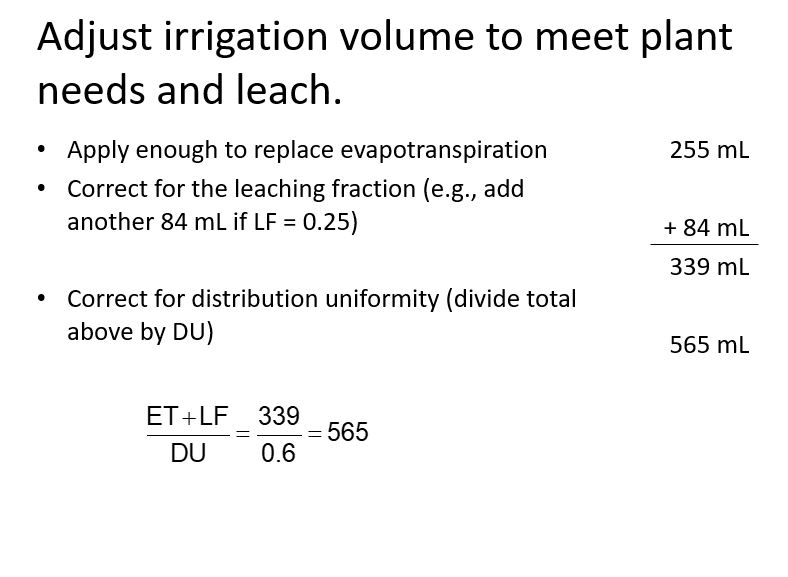 In the middle of the ranges, you can see that the leaching fractions are in the 0.2 to 0.25 range, which means, in this case, that about another 20 or 25% water needs to be added to the water applied to the crop. (The exact amount is explained in the handout). Fig 2. Surveys of nursery practices indicate that most commercial growers leach excessively. Although this prevents salt accumulation in container media, excessive leaching wastes water and fertilizer and may contaminate groundwater or surface water. Irrigation systems are imperfect. Some sprinklers or emitters put out more water than average and others apply less than average. To meet the needs of plants that receive less than average amounts of water, growers must supply excessive amounts to other plants. Measuring the uniformity of irrigation systems gives growers two important pieces of information. It provides a measure of how good the system is. In many cases, there are simple steps that can be taken to increase uniformity (for instance, using better nozzles, repairing leaks, and eliminating sources of large pressure drops). 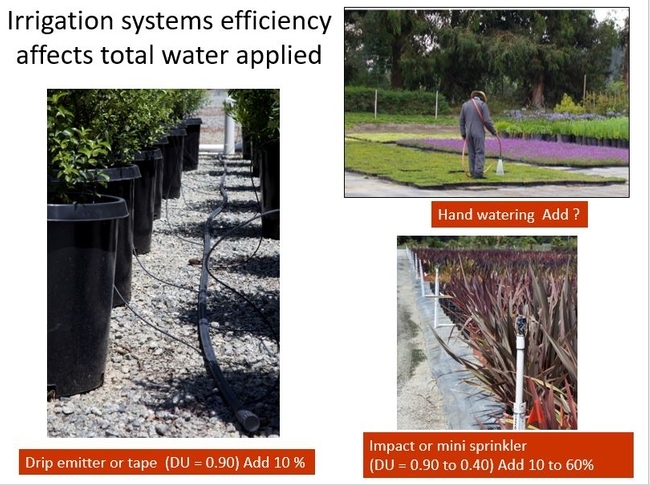 Second, the measured irrigation uniformity gives growers a way to decide how much more water needs to be applied to compensate for the inefficient system. Irrigation systems can be evaluated in the field, and an efficiency value can be determined called the distribution uniformity (D.U.). (Measuring D.U. is explained in the handout). Drip irrigation systems are usually very efficient, usually with a D.U. of around 0.9 (A D.U. of 1.0 is perfect). Sprinkler systems are less efficient, with a D.U. between 0.4 and 0.9, and hand watering efficiency is usually unpredictable but usually is not efficient. Fig 3. Fig 3 Irrigation systems distribution uniformity (DU) and required extra water volume needed. In conclusion, the total amount of water that needs to be applied to a crop is equal to the total evapotranspiration since the last irrigation plus the extra water needed to compensate for the salinity in the irrigation water and the lack of uniformity of the irrigation system. Fig 4. Attached is a really nice article from Richard Evans that gives some examples to increase your understanding of irrigation efficiency, water quality and their impact on the total amount of irrigation water applied.